Thread painting is a phrase used by modern day quilters to describe the heavy use of thread, usually by machine, on the surface to create the look of painted strokes. 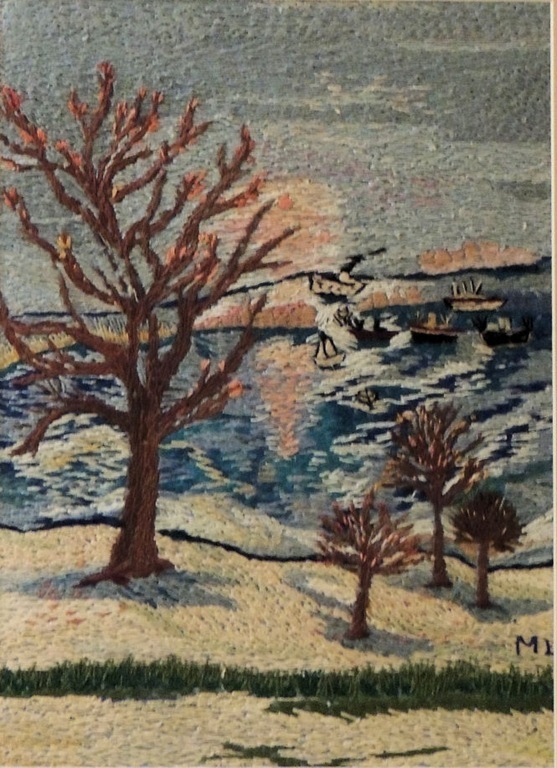 My grandmother, Mollie Harowitz, wasn’t a quilter and never heard of thread painting. I never saw her use a sewing machine. 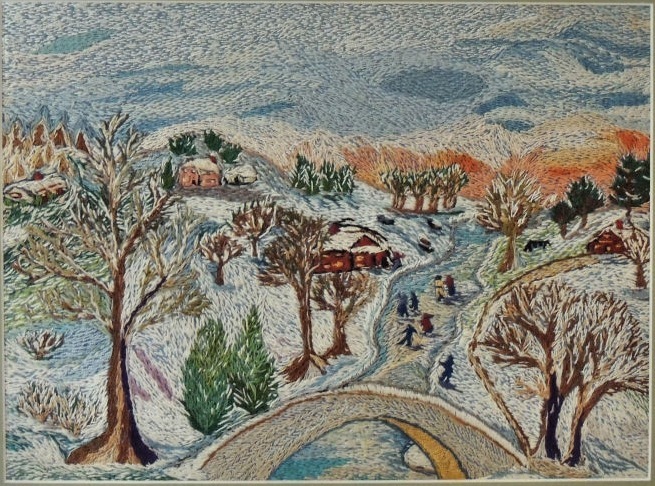 She did all her work by hand, most of it after she developed arthritis in her fifties. Mollie did all her work with embroidery thread. In those days, that usually meant silk thread. The pieces glow as if they were lit from within. She had no lessons that I ever heard of. She would just take a piece of fabric and sketch a picture on it with a pencil. Then she filled in the whole thing with stitches. 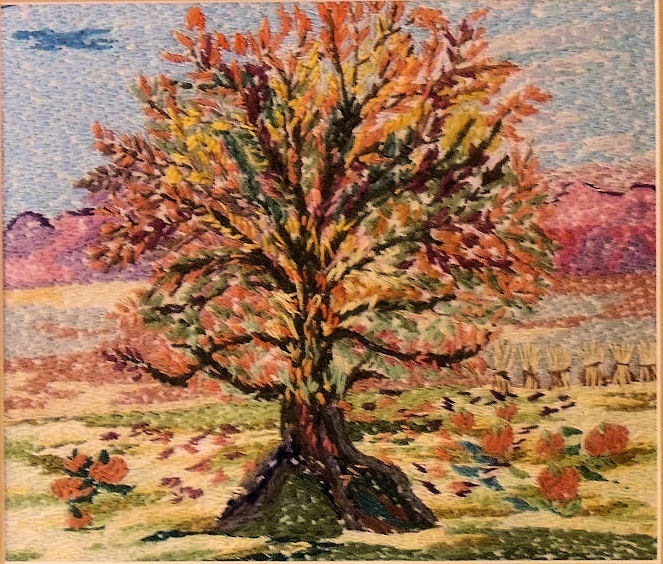 The tree picture above is fairly typical of her early work. Most of the stitches are simply short straight lines, often overlapping neighboring stitches. She didn’t pay a lot of attention to perspective and apparently never gave much consideration to how a work would be framed. In the harbor picture above, you can see that her initials are cut off on the side. Grandma got better at shading things as she did more work. You can see the depth in the grass in the foreground and the darker threads on the shady side of the trees. She even began to show the shadows on the ground. I don’t know where you would be standing to get a view like this of a house and the driveway. It’s almost as if she were seeing it from an airplane. 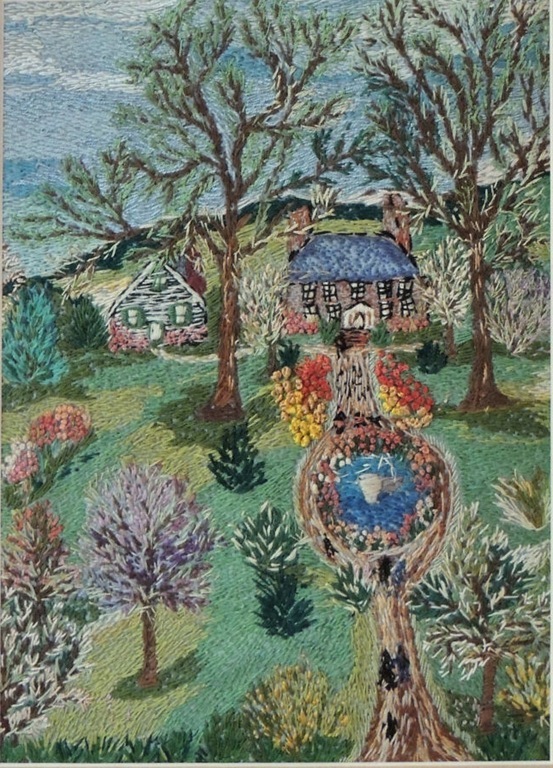 She worked hard to put details in this picture but they are often out of scale with the yellow flowers (French knots) as big as the heads of the people coming up the driveway. Yet the whole thing fairly throbs with life. My parents had these pictures and many more hanging in their house. For reasons I will never understand, almost all of them were put into elaborate old frames, carved and gilded to within an inch of their lives. The mats were bright blue, red or green and dwarfed the subtle beauty of the embroidery. I ended up taking most of them home. The first thing I did was have them re-matted in organic neutrals and framed with a plain dark wood. I have trimmed all that off the photographs so you can just enjoy her work. I hoped my children would fall in love with them once they saw them reframed but no such luck. The background fabric was blue in this picture which gives the sky a wholly different look with the dull blue peeking out amidst the wisps of snowy clouds. She did a better job with the people. Instead of just dark smudges, they are clearly wearing different clothes and you can see them moving on the ice. It looks like there are several people in the background riding sleds down to the water. Each part of the picture contains other little details.